There’s nothing better on a cold day than curling up by a nice warm fire, but setting up a wood burning fire and cleaning up afterwards can be a hassle. With gas logs, you get all the best parts of having a fireplace with none of the work. There are just a few things you need to consider when purchasing a gas log set. Find the answers to the most frequently asked questions about gas logs down below. • What is the difference between “vented” and “ventless” gas logs? • Are ventless gas logs legal in my state? • Can I install gas logs myself? • What should I do before getting my gas logs installed? • What size gas logs do I need? • Does Gas Log Guys/Shoppers Choice carry replacement parts? • How long do gas logs last? • Do gas logs need regular maintenance? • How much does it cost to use gas logs? • How do you light gas logs? • Are the flames on gas logs adjustable? • What is the purpose of a safety pilot on gas logs? • Should the pilot light be turned off in the summer? • Do gas log embers burn and do they ever need to be replaced? • Can wood be burned with gas logs? • Can gas logs be installed in a coal burning fireplace? • How long are the warranties for gas logs on Gas Log Guys/ Shoppers Choice? • Why choose Gas Log Guys? What is the difference between “vented” and “ventless” gas logs? Ventless gas logs (also known as vent-free gas logs) are designed to provide supplemental heat to a space, while vented gas logs are designed for decoration. Vented gas logs may produce a small amount of heat, but they are not intended to heat a space. The other important distinction is “flame impingement.” Vented gas logs look more realistic because the flame is allowed to “impinge” on, or touch, the logs. Most vented logs can also be repositioned to the users' liking. This makes the vented sets look far more realistic. On the other hand, the burners on ventless sets are designed to fit with the logs in a specific position to minimize impingement for safety. The last major distinction between vented and ventless gas logs is installation location. Since they produce carbon monoxide, vented gas logs must be installed into a fireplace with a functional chimney. Ventless gas logs do not require a chimney to be installed in your home. Ventless gas logs just need to be installed into an approved pre-fabricated ventless firebox. Our video about the differences between ventless and vented gas logs goes more in depth on the details if you want more information on the topic. Are ventless gas logs legal in my state? Currently, ventless gas logs are not legal in California, Wisconsin, and Montana. In addition, some local counties and cities, such as New York City, have banned ventless gas logs, even though the state law permits them. If there is a question of legality or code in an installation, it should be addressed before a purchase is made. If you are unsure if your state, county, or city allows ventless gas logs, call your local gas company to ask them. Can I install gas logs myself? Gas logs should be installed by a qualified professional. We strongly recommend you use an HVAC installer or licensed plumber. These professionals have specific training to install gas fireplaces, log sets, and stoves as well as their venting systems. In addition, these specialists are fully qualified and have all of the required materials and tools on hand to make the connection safely and ensure it complies with code. What should I do before getting my gas logs installed? Have your chimney cleaned thoroughly prior to installing your new log set, even if you have not been using your fireplace. It is truly amazing what can come out of a chimney that has not been used. It is very important that this step has not been skipped as any build-up of creosote can cause a chimney fire due to the heat that is generated with the log set. The firebox should be as clean as possible prior to installation as well. This will make it easier and much cleaner for your installer. If you are installing propane, make sure that your propane tank has sufficient fuel so that the installer is able to properly check the valves and piping for potential leaks. Your primary concern is the log set fitting into the fireplace, but also consider that it must have enough clearance from the fireplace walls to prevent overheating. Gas logs need to fit properly in your fireplace; bigger is not better in this situation. While actually fitting the set into the fireplace is a primary concern, it must have enough clearance from the fireplace walls to minimize overheating even if the set fits within the fireplace's specifications. Overheating can cause the set to fail. Not only is this a concern for the life of the product, but more importantly a safety concern. To find out what size size gas logs your fireplace calls for, use our gas log calculator. Does Gas Log Guys or Shoppers Choice carry replacement parts? Gas Log Guys and Shoppers Choice offer a wide range of basic replacement parts. Our Gas Log Parts section contains these parts. For parts that are specific to the gas log model you own, consult an authorized dealer or the manufacturer of the gas log set. This depends on a few things. For one, the material they’re made of plays a big role in its lifespan. Gas logs made of refractory ceramic are higher quality and will last many years. Gas logs made of refractory cement don’t last as long because they tend to crack over time, but are still fairly durable. Gas logs made of ceramic fibers tend to be priced the lowest but also have the shortest lifespan. Another factor is the type of gas logs you own. Ventless gas logs last longer than vented gas logs due to the flames not having direct contact with the logs. Usage will also affect your gas log’s lifespan. Gas logs used in commercial settings, for example, where they are run continuously all day and all night will not last as long as gas logs used in a home where they are only lit for a couple of hours a day for a couple months of the year. Finally, maintenance plays an important role in how long your gas logs will last. To learn about gas log maintenance, please scroll down to the next question listed below. Do gas logs need regular maintenance? Ventless gas logs should be inspected annually by a qualified service professional. Aim to do this when the weather starts cooling down so your fireplace is ready to be used for the season. Vented gas logs don’t need regular maintenance but having the gas connection, valves, and pipes inspected occasionally is a good idea. Your gas logs may collect some soot but you can easily clean them with soot remover spray, no wiping required. How much does it cost to use gas logs? Gas logs are typically inexpensive to operate, however, your cost will vary depending on the price of gas in your area and how frequently you light your fireplace. If a gas company charges less than a dollar per Therm, ccf or 100,000 BTU, and the BTU rating of the gas log set is under 100,000 BTU, then the cost per hour will be less than a dollar. Compare that to the cost and time of ordering, re-ordering, delivering, and stacking firewood. How do you light gas logs? There are 3 types of ignition available on gas logs. The simplest form of ignition is the “match light” option. Simply hold a match or log lighter to the burner and open the gas valve. This is also the most inconvenient way to light gas logs. A manual safety pilot is available for most makes and models of gas logs. This method is connected to the gas logs and uses a push button igniter and pilot light. Remote safety pilots operate similarly to manual safety pilots but additionally can be controlled with remotes, wall switches, and even thermostats, which tend to be sold separately. Ignition options vary by venting style. This video about the different gas log ignition methods explains everything in depth if you want to learn more. Are the flames on gas logs adjustable? What is the purpose of a safety pilot on gas logs? The safety pilot on a gas log set shuts off the flow of gas to the burner should the pilot light go out or the normal flow of gas get disrupted. Should the pilot light on a gas log set be turned off in the summer? While it is not necessary, in order to save money on fuel costs, we highly recommend it. Do gas log embers burn and do they ever need to be replaced? Glowing embers complete the look of many gas logs but do not actually burn. They are made from an organic fireproof material. However, embers do fade over time and will periodically need to be replaced. Embers can last up to five years depending on how frequently you use your fireplace. We have found that replacing embers every three years keeps a log set looking brilliant. Can wood be burned with gas logs? No! Never attempt to introduce any foreign objects to a gas log fire. Even if the gas logs have been removed, a gas log burner is not designed to hold or burn wood. This could damage the fireplace and the gas log burner. In addition, it will also void the warranty and is generally unsafe to do. Can gas logs be installed in a coal burning fireplace? No. Coal burning fireplaces are built and set up solely to burn coal. The coal fireplace must first be removed and a new firebox installed before a set of gas logs can be safely put in. How long are the warranties for gas logs on Gas Log Guys/ Shoppers Choice? To compare warranty information on our gas logs, consult our gas log warranty charts. For detailed warranty information, please see user manuals. Why choose Gas Log Guys? 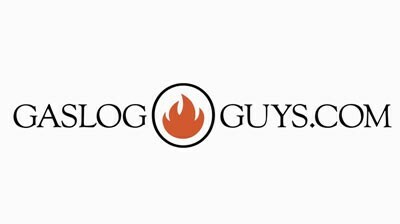 At GasLogGuys.com, our goal is to help you find the right solution for your fireplace. We've been in the business for over 20 years so we're experts on everything from gas logs and accessories to electric fireplaces.